Stronger Communities Stronger Schools (SCSS) pairs Wellesley student volunteers with students in Boston Public Schools. 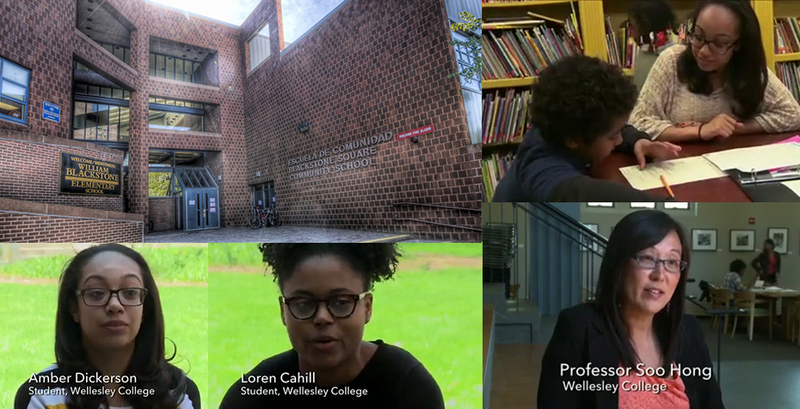 The program, which grew from fieldwork by Amanda Wyatt ’11 for Assistant Professor of Education Soo Hong’s Urban Education Seminar, was recently featured in a video shown on several NBC newscasts across the country. Wyatt, who was interested in developing a partnership between Wellesley students and Boston public schools and community organizations, started the program with just five volunteers. Today, Stronger Communities Stronger Schools has grown to more than 40 members. The program began with Wellesley volunteers serving in Blackstone Elementary School classrooms as teacher aides, and supporting a project to rebuild the school library. At the end of the school day, volunteers walk across the street with students to St. Stephen's Episcopal Church to provide homework assistance, tutoring, and enrichment classes. The volunteers, according to an informational page on the St. Stephen’s website, “provide invaluable support for the Blackstone Elementary School and St. Stephen's after-school program, B-READY.” Over the years, Wellesley volunteers have developed new programs and curriculum to support girls' groups, peace education, and the visual arts. According to Hong, the organization has grown substantially and now serves communities in the South End, Chinatown, and Lower Roxbury. Her Urban Education Seminar continues to bring students into Boston schools: “Each student has a field experience in a Boston school, and I think that’s where the real learning happens,” Hong said. Professor Soo Hong’s research focuses on urban education, community organizing, and parent engagement. She was recently quoted in a story by the Seattle Times republished by the Chicago Tribune on the power of parents in schools.